We are very excited to announce our latest five publishers: BOOM! 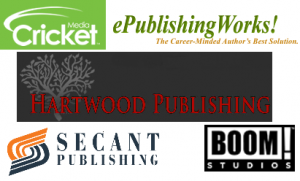 Studios, ePublishing Works, Cricket Media, Hartwood Publishing, and Secant Publishing. Take a look at our mention in Publishers Weekly for the full press release.